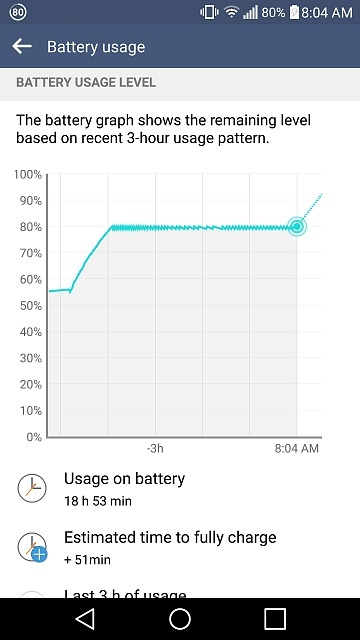 My LG G4 sometimes charges in a weird way. It will charge normally until it gets to 80% and then it will charge up a bit, drop back to 80, and then repeat that. I have included a screenshot of the charging graph. I have an app called boinc installed and I think this may be caused by it, but it doesn't always happen. Boinc uses a phone to crunch numbers for scientists while the phone is asleep and above a certain battery percentage. It would be one thing if it always happened, but it happens randomly instead. It looks more like a battery problem, but next time you charge, just use the boinc manager to exit boinc first - then you'll know if boinc is causing the charging problem. It only does this sometimes. I won't be able to easily tell if boinc was causing it or not. Why is my phone showing app notifications intermittently? Battery draining too fast to charge and boot?